Paleo blueberry muffins are a protein-packed baked good made with grain-free and natural ingredients. Each tender muffin is bursting with blueberries for a satisfying, healthy breakfast. Paleo blueberry muffins fresh from the oven are a delicious morning treat, bursting with antioxidant-packed blueberries and grain-free ingredients. The blend of three flours; almond, coconut, and arrowroot, provides a light texture with golden brown domed tops. A generous amount of eggs are whisked together to provide air and structure to these baked goods. Each muffin is naturally sweetened with coconut sugar to add tenderness to each bite. The combination of ingredients provides a texture similar to whole-wheat flour, without the gluten. This is a great recipe for a Paleo diet snack. Is your pantry packed with paleo-friendly ingredients to do some serious baking? 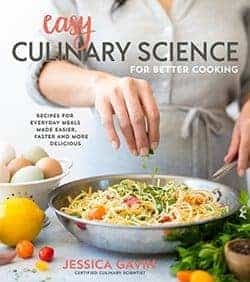 I have some essential components I always have on hand as gluten-free and grain-free substitutes for flour, dairy, refined sugar, and corn-free leavening agents. These paleo muffins require a few unique ingredients to help mimic the function of gluten found in all-purpose flour. Nut and Starch Flour: Coconut, arrowroot, and almond flour work harmoniously together to create a muffin structure base that creates crisp muffin tops and fluffy centers. Using only one flour will not work as each provides its unique quality to the muffins, and balancing the amounts is the key. Sweeteners: Coconut sugar is allowed in the Paleo diet because it’s a natural sweetener from the coconut blossoms of the coconut tree that’s made into a syrup and then dried. The trace amount of nutrients like iron, calcium, zinc, potassium and prebiotic fiber from inulin makes it a better substitute for granulated sugar. The bonus is the dried sugar granules provides similar functions in baked goods. It has a hint of molasses and earthy flavor. Coconut Oil: It can be a substitute for butter in baking due to its high smoke point and neutral flavor, unless you have some ghee available. It comes in refined or unrefined options. The coarse product has more of a coconut flavor. Leavening Agents: Baking soda and cream of tartar are often used in combination with Paleo baking. Baking powder contains corn starch to keep it from caking together over time, which is not allowed on the Paleo diet. The wet ingredients are combined with the arrowroot flour to create a light and airy base using a mixer before the dried parts get added. Fresh blueberries are then folded into the muffin batter just before baking. I’m a big fan of blueberries, I love how the juicy dark berries pop and create a jammy flavor in the muffins. I like to add a few extra on the top so that they form a prettier surface with more fruit baked in. A little bit of coconut sugar is sprinkled on top to add a little crunchy sugar glaze. Fresh from the oven! It will be tough to resist letting these blueberry muffins cool before you’re tempted to eat one, maybe two! High rise, golden brown paleo blueberry muffins are a beautiful pastry to be devoured by all. Because coconut flour contains fiber, I’ve found the texture to be similar to whole-wheat muffins, but not as grainy or dry as it can sometimes be. The muffin tops add a slight crunch while the blueberries keep the bread moist and flavorful. These paleo muffins are perfect for meal prep. Make a batch, eat a few fresh and then wrap the extras in plastic wrap and freeze. Grab and reheat anytime you need a quick bite! 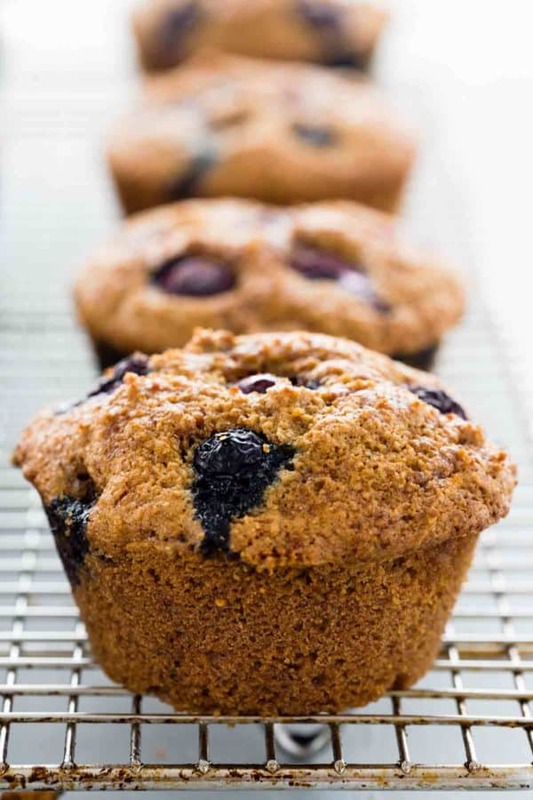 The moisture from the blueberries causes the muffins to get soggy after about a day if you don’t enjoy them right away, so it’s best to eat them the same day or freeze for later. I hope you enjoy! Arrowroot has become a trendy ingredient to use in paleo and gluten-free baking. The starch is flavorless and acts as a binder of water, creating a light and soft texture in muffins. After mixing with the liquid ingredients, the batter should sit for 30 minutes. This gives the starch time to absorb the water and gives a less gritty texture in the pastry. Paleo blueberry muffins are a protein packed baked good made with grain-free and natural ingredients. Each tender muffin is bursting with ripe blueberries for a satisfying paleo diet breakfast. Adjust oven rack to middle position and heat oven to 325°F (163°C). Melt 1 tablespoon of coconut oil. Use a brush to oil the insides of a 12 serving muffin pan with the coconut oil. Set aside. Using a stand mixer fitted with a whisk, combine on medium speed arrowroot flour, eggs, water, 3 tablespoons melted coconut oil, vanilla, lemon juice and coconut sugar, 1 minute. Allow mixture to rest for 30 minutes in the bowl. Meanwhile, prepare the rest of the batter. In a medium-sized mixing bowl whisk together the dry ingredients; almond flour, coconut flour, baking soda, cream of tartar, cinnamon and nutmeg. With the mixer set to low speed, add the flour mixture to the wet ingredients and mix until incorporated, 30 seconds. Scrape the bowl and increase speed to high, whip batter until light and fluffy, 1 minute. Fold in 1 1/2 cups of the blueberries. Divide batter evenly among a muffin tin, they will be filled to the top. Use the remaining 1/2 cup of blueberries to evenly distribute and place on top of the muffins. Sprinkle coconut sugar on the tops of the muffins. Bake muffins until golden brown and a toothpick inserted in the center comes out clean, about 25 minutes, rotating halfway through baking. Allow muffins to cool in the rack for 10 minutes. Carefully remove and transfer to a cooling rack to cool before serving. Arrowroot flour is also called arrowroot powder or arrowroot starch. Bob's Red Mill superfine almond flour was used. Muffins are best enjoyed that same day. They can be stored in an airtight container at room temperature for up to 1 day. Warm in the oven at 300°F (149°F) for 10 minutes. Muffins can be individually wrapped and stored in a resealable bag in the freezer for up to 3 weeks. Microwave for about 1 minute and then warm in the oven at 300°F (149°F) for 10 minutes. Frozen blueberries can be substituted for fresh blueberries. Defrost and rinse with water, and then dry on paper towels to absorb excess moisture. 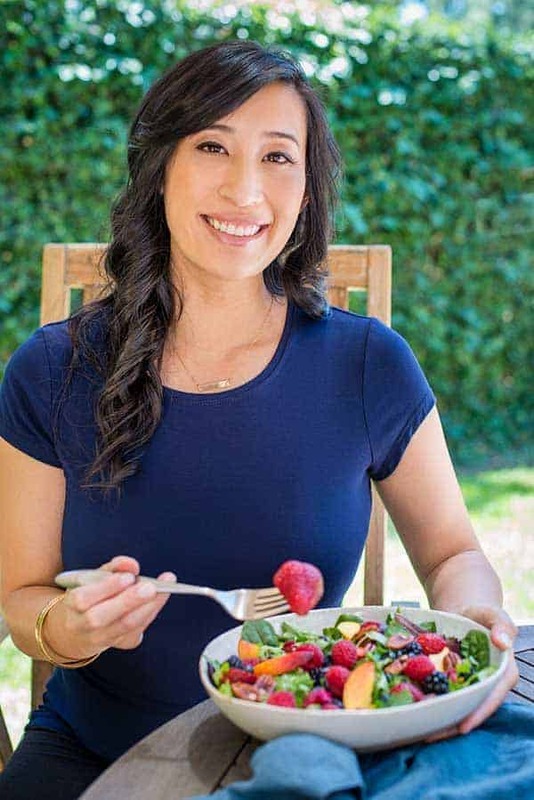 « Almond Flour Nutrition, Benefits & How to Use It! Letting the arrowroot soak for 30 minutes is a new concept to me, but that makes total sense!! I am looking forward to trying them. I just have one question, my husband can’t have coconut so I was wondering if I could omit it and perhaps up the amount of almond flour to compensate. Do you have any idea how much I would need to replace the coconut flour? I was thinking maybe 9 tablespoons extra almond flour instead of the 3 tablespoons of coconut flour. Hi Esther- I would first try replacing the coconut flour with 3 tablespoons of almond flour. If the batter seems too wet, then you can reduce some of the water, as coconut flour soaks up a lot of moisture. Try the first option, then if that’s not a hit, we can chat more about water amounts. Any idea how to prevent that or if I can better this batch? Hi Diane- Did it seem like you could bake for a few minutes longer without the sides getting too brown? I would increase the time a few minutes, or let it cool in the pan for 15 minutes instead of 10.